Don't be surprised when the dock boy offers valet parking. 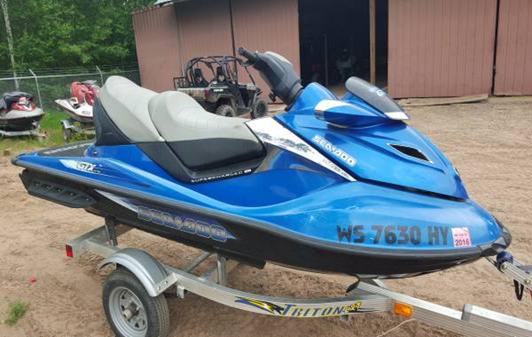 As if the most fully-featured watercraft in the industry wasn't already loaded enough, 2007 marks the arrival of another level of luxury. Thanks to a sleek, sophisticated new look, ultra comfy new touring seat, and the usual amenities you'd expect from our top-of-the-line model. All powered by the 215 hp supercharged, intercooled Rotax 4-TEC engine. Shall I bring your ride around, sir? New, watertight removable storage bin and tray: The largest storage capacity in the industry (33 gallons/125 liters). Digital infocenter with new depth gauge: 19 function digital infocenter. Sleek, easy to read gauges for info at a glance. New, wider handlebars: For more comfort and easier maneuverability. 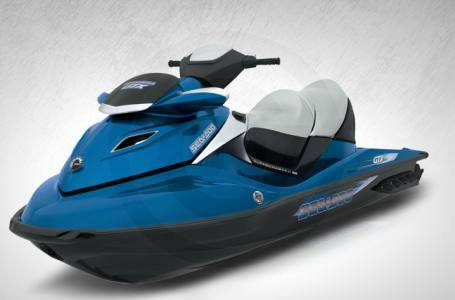 Learning key: Sea-Doo Learning Key for learning to ride with greater confidence and control. Glove box with removable GPS: Glove box with built-in handheld GPS. Engine: 215 hp Rotax 4-TEC Intercooled Supercharged 1494cc Engine. New touring seat: For a more comfortable ride and better lower back support. CLCS: Closed-loop cooling system improves durability and keeps the engine and its coolant at the ideal operating temperature for maximum performance. Also comes with: Removable dry bag, removable front tray, safety kit, mooring cable, sand bag anchor, waterproof cellphone case, recessed cargo cleats. Reboarding ladder: For easier boarding. OPAS: Assists steering during off-power, as well as off-throttle situations. Forward/neutral /reverse: Improves maneuverability especially around docks and trailer ramps. Temporary docking loops: Provide access for quick tie-up. Double density comfort hand grips: Provide extreme hand comfort and greater looks. New, wide handlebars: Adjustable, with ergonomic design for ease of use and comfort. Multifunction Digital Information Center: Reports 19 key operating functions: Fuel Level Low Fuel Level, Low Oil Pressure, Low Voltage, Hi Voltage, Tachometer, Overheat, Hour Meter, Maintenance Info, Speedometer, Compass, Error Codes, Check Engine, Lake Temperature, Depth Gauge, Sensor Check, Key (battery protection), Key (wrong key), L-Key. Supercharged 1494cc four-stroke, intercooled, Rotax SOHC with four valves per cylinder: 215 hp Supercharged Intercooled Rotax 4-TEC engine provides reliable ultra-high performance in fresh or salt water, increased torque at low RPM, ptimized power at all RPM levels and throttle positions. Multi-port fuel injection: Better control of exhaust emission and power at all RPM range to reduce emissions and reduces fuel consumption. 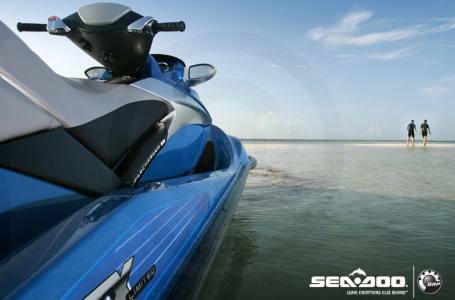 Sea-Doo Learning Key™: LK1 – Limits engine RPM and top speed to about 35 mph. LK2 – Limits engine RPM and top speed to about 50 mph. Options are programmable by dealer.